Didier Deschamps has named his France World Cup squad and it’s not good news for Alexandre Lacazette and Anthony Martial with the Arsenal and Manchester Utd stars being left out, according to Sky Sports. Deschamps has taken five players from the Premier League including: Tottenham goalkeeper Hugo Lloris, Manchester City defender Benjamin Mendy, Chelsea midfielder Ngolo Kante, Manchester United midfielder Paul Pogba and Chelsea’s Olivier Giroud. 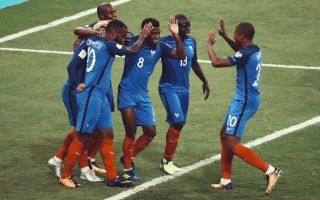 Such is the riches of talent on offer to Deschamps, he has a standby list that will cause envy to many international coaches around the world. Lacazette and Martial have been included on that list – but Dimitri Payet has also been left out of the squad through injury too, as reported per Sky. The Marseille star limped off in tear during his side’s Europa League loss to Atletico Madrid. First Wilshere now Lacazette. Absolute joke. Mendy played 5 or 6 games for City all season, Deschamps still picked him. He picked Thauvin ffs, Deschamps is a Pratt. Nothing Martial can do about that. Wissam Ben Yedder (Sevilla), Kingsley Coman (Bayern Munich), Benoit Costil (Bordeaux), Mathieu Debuchy (St Etienne), Lucas Digne (Barcelona), Adrien Rabiot (Paris St Germain), Mamadou Sakho (Crystal Palace), Moussa Sissoko (Tottenham), Kurt Zouma (Stoke).